I love Gerda Steiner's critters, they are so cute; and these kitties are no exception. I've of course colored them simply and similarly to the three trouble makers (l to r) Digger, Little One, and Jack. Digger is a one person cat, his life is all about my Dad. Little One is a stray that showed up last summer - very wild though she is now starting to domesticate with humans other than my Dad. On my most recent visit she was schmoozing with hubs and I. And lastly Jack - he is a big fluff ball--friendly, loves tummy rubs and is a constant gift bringer. I'm sure my Dad will recognize them all. I added Nuvo drops for the eyes to make them pop a bit, and hand wrote the sentiment. Oh my gosh.. This card.... Are all 3 of those cats on the same Stamp set?? If I colored that left one orange, it would JUST like my Taffy girl. She’s a one person cat as well. Bites everyone else. She cost me over $500 at the vet today, but I’d do it again in a heartbeat. Anyway, I think this card is so so adorable. I love that they all match your Dad’s cat’s personalities. You gave me a total visual. Your Dad is my kind of guy ... my guy would have six cats if i'd let him!! What a delightful little Valentine - your Dad is a lucky cat, Cat! Misty, yes all three are on the same set called All Cats. Oh my goodness--absolutely perfect card for your dad, Cat! Love your coloring & your hand writing! 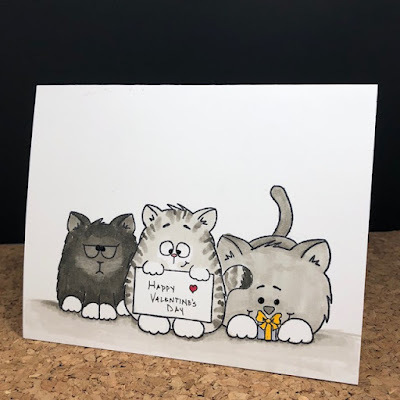 Loving those mega cute cats and the sweet back story to your card, made me smile! 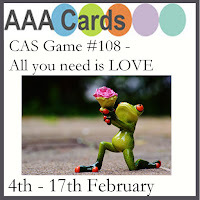 Thanks for joining in with the current challenge at AAA Cards.